The pictures that came out of Houston and other areas that were hard hit by Hurricane Harvey were pretty awful. There were numerous photographs of people with young children and pets wading through high water in the hope of being rescued by boat or helicopter. There was also the picture of elderly people in a nursing home sitting in waist high water waiting to be rescued. It was a pretty horrible story. 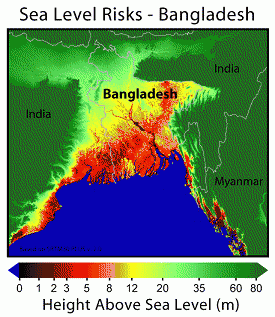 Bangladesh does not have large amounts of resources to assist the people whose homes are flooded. It does not have the same number of boats and helicopters and trained rescue workers to save people trapped by rising water. Nor can it guarantee that people who do escape will have access to adequate shelter, medical care, or even clean drinking water. This means many more people are likely to be dying from floods in Bangladesh as a result of the impact of global warming. Ironically, as Houston and Texas were still being hit by Harvey last week, a building collapsed in Mumbai, India, likely the result of the pressure from this year's monsoon rains and the resulting floods. Nineteen people were reported dead from the collapse with another 30 having been rescued after being trapped in the rubble. So far this summer more than 1,000 people across south Asia have died as a result of flooding from the monsoons. We are likely to see many more incidents like this building collapse, as well as more people drowning in floods due to the effects of global warming. In the U.S. the debate over global warming is often treated as one between those who like government intervention and those who support a free market. This is nonsense. Allowing people to emit greenhouse gases without paying for the damage done is like allowing them to dump their sewage on their neighbor's lawn. No one seriously argues that it is a free market principle that they get to dump their sewage on their neighbor's lawn. Everyone understands that we are responsible for dealing with our own sewage and not imposing a cost on our neighbors. It's the same story with the greenhouse gases that cause global warming, even if the chain of causation may be somewhat more complicated. At this point, we have pretty clear evidence that the planet is warming, with the predictable bad effects like rising oceans and more severe storms. We also know that greenhouse gas emissions are the main cause. The emissions from the United States and other wealthy countries will result in a lot of Harvey-like disasters in Bangladesh and elsewhere in the developing world. We should be moving quickly to try to limit the harm. We should also be giving these countries the assistance they need to deal with the disasters that we have caused them. This isn't a question of charity, it's a question of whether we think we can get away with ruining the lives of the world's poor just because we are rich and powerful.